Conveniently located in the heart of downtown Boston at Lewis Wharf, this boat is just steps away from the New England Aquarium, Quincy Market/Faneuil Hall, the North End, Boston Garden, a public ice skating rink, and countless other things to see and do. The boat is docked in a secure marina locked by a gate. Only those with the key can pass through the gate. The waters are generally calm in this area but there can be some occasional movement during the day when boats pass by. At night the waters are very calm and some guests even find that a bit of gentle swaying relaxes them and makes for a very restful sleep. 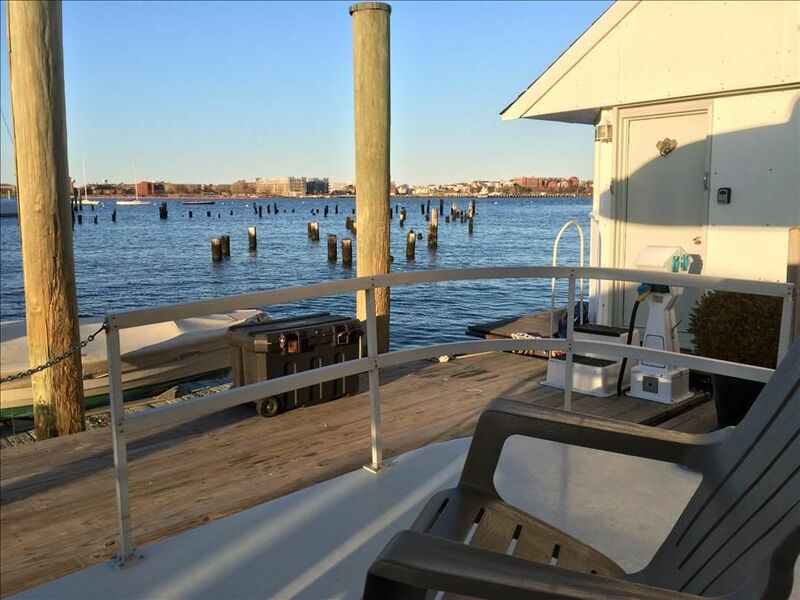 After a long day of touring the city there is nothing better than relaxing on your own private deck with a cold drink in hand, listening to the soothing sounds of the ocean as you enjoy the fantastic waterfront atmosphere! Take advantage of the opportunity and reserve this boat with SleepAfloat! Lewis Wharf is a private dock with close neighbors in an exclusive North End residential area. Quiet time is from 10 pm to 8 am. Please be respectful of our neighborhood. Rates are quoted for two guests. Each additional guest is $50/per person/night. Cleaning Fee $119. Insurance Fee $39.• Holiday rates are higher - please call for rates.• Guests must electronically sign off on our SleepAfloat Rental Terms & Conditions within 48 hours of booking to validate confirmation. Check in and check out: The rental period begins at 3:00 p.m. on the day of arrival and terminates at 11:00 a.m. on the day of departure, unless prior arrangements have been made. Early check ins must be pre-approved, and check-ins after 11 p.m. are not allowed. A fee may be incurred for check ins between 8 p.m. and 11 p.m. may incur a fee. The properties are professionally cleaned and inspected before and after each rental to ensure that all guests have a clean comfortable stay. Occasionally delays may occur during peak season. Great time aboard on the Boston Harbor! Me and two buddies spent a long weekend aboard the Houseboat Taurus. You couldn't ask for a better location and accommodations. Coffee on deck overlooking the harbor each morning was a treat and the boat was very comfortable. We will definitely stay here again! Loved it! But WiFi was sketchy, at best. Everything about this was wonderful and fun! I was in town on business however, and needed WiFi to work. Although there were several WiFi options, none worked very well. That is my only complaint. It was a wonderful way to experience Boston! Fantastic way to relax with no crowds and lots of privacy. See the two twin beds being great if you had more. Surprised at how calm the water was overall. We spent some time at night, after our day of being out with our son, sitting and relaxing with a drink overlooking the water. My teenage son and I stayed this week and had a great time in the beautiful city of Boston. Beds were comfortable and water in the shower was hot. A/C worked great and we were there during a heat wave. Be careful up and down the walkway as it can get slippery when it rains and watch for bunnies on the lawn. There is a fridge for leftovers or simple items. There is a Keurig for morning coffee while watching the marina activity. It took my son a night to get used to the boat movement, it calms down at night. So don’t worry about that. Not much cookware, but with 99+ restaurants within a 15 minute stroll-why cook? We had Anthony’s every morning for a simple quick good breakfast and then walked to the market or to the aquarium and Paul Revere House along the freedom trail. Ubers or Lyft are the way to get around (JFK Museum was awesome) or do the trolley and jump on and off for sightseeing. Take the ferry over to the Naval shipyard to see the USS Constitution and the interactive museum. Our fave for dinner was Panza and definitely Mike’s Pastry for dessert. Staying here was so much fun. We have 3 teenagers and they loved it. It was worth the money to have this unique Boston experience. The location was easy walking distance to restaurants, a grocery store, Quincy market and the T. The dock was quiet at night and the atmosphere was fantastic. We enjoyed dinner on the deck one evening and watched the boats come in and out of the harbor. The boat is clean and nice! Book it. You won’t regret it. Our Downtown Boston location is conveniently located in the heart of downtown Boston, just steps away from the New England Aquarium, Quincy Market/Faneuil Hall, the North End, Boston Garden, a large outdoor neighborhood swimming pool, a free tennis court, a public ice skating rink, and countless other things to do and see.